The South of England cross-country championships returned to their home course at Parliament Hill Fields in London – and 25 Chichester athletes were in action. Those taking part ranged from under-13s to seniors and the whole squad emerging with credit. Open to runners from Norfolk down to Cornwall and involving the whole of the home counties, this fixture – held last year at Brighton – is always of a high standard and any place in the top 100 is a mark of being along the best in the south. Once again, for Chichester, the best-represented group were the senior women, with nine members of the club in action – resulting in a well-fought 34th place among 70-plus clubs who fielded a full team. Having missed the Sussex championships earlier in the month, Lucy Thraves led the squad home in a fine 113th place, beaten by only two other Sussex runners. There was good packing from the other three scorers in the A team. Sophie Wright having a good latter part of the tough, undulating 8k course over Hampstead Heath to pull through to 246th, with Charlotte Reading in 273rd and Anne Sydenham 306th. There was an equally good showing from the B team with Jenny Jakeman 396th, Nadia Anderson 407th, Jo Prosser 512th and Amanda Godfrey 561st with reserve Sue Baker 620th out of more than 700 starters. In the girls’ under-15s, Cerys Dickinson ran a well-judged race for 164th with Nicole Boltwood in 238th, closely followed by Emily Weymouth. 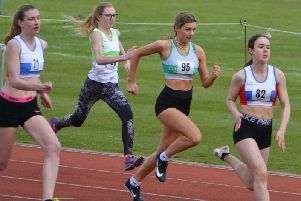 Of local interest in the under-17 women’s contest, Seaford College pupil Olivia Macdonald ran a fine race for her club, Guildford and Godalming, to finish third, her best in this event, continuing her rich form following her win at the Sussex schools championships ten days earlier. In the men’s races, Chichester best result was from the under-17 men, who finished 17th in the team standings – although it was a question of what might have been in another two age groups. Ned Potter was another to continue recent good form and led the under-17s home in 59th place with Alfie Spurle 182nd, Harry Sage 206th and David Bisatt 224th to leave Chichester third-best Sussex team on the day behind Hastings and Crawley and just in front of Brighton & Hove. In two other age groups, the lack of a fourth scorer cost the club potentially good places in the standings. This was nowhere more evident than in the under-20 men’s race where Chichester had its top two individual placings of the day. Ben Morton had the race of his life to finish strongly in 31st place, just beating team-mate Leo Stallard to the finish just eight places further back and third scorer Brodie Keates in 103rd. In the team standings Horsham packed well to finish fourth, the highest team placing for Sussex of the day, but his was a team which only just pipped Chichester in the county championships at Bexhill three weeks earlier. In the under-13 boys’ race there was a similar story with Harvey McGuiness 29th, just over ten seconds in front of Fionn O’Murchu in 83rd, while Max Sydenham in 206th was barely a minute slower than his two team-mates. Both Gabryel White and Bradley Holder battled well in a very competitive under-15 boys’ race for 224th and 286th while the club’s major disappointment was only having a single finisher in the 15k senior men’s race. Paul Stallard flew the flag for the club just a week after running in the Sussex masters championships, his second tough cross country in eight days. A squad of six athletes represented Chichester in the first Sussex Sportshall fixture of 2019 at Horsham – and emerged with a hat-trick of first places. There was a double win in the two-lap sprint with new Sussex under-11 record holder James Taylor maintaining his unbeaten run for the season with another A string win. He was backed up well by Sam Cato, who ensured maximum points in the event for the club by winning the B string in equally fine fashion. Ethan Cooper ran in the non-scoring two-lap race, then scored in both the long jump and speed bounce, supported well by Cato and Taylor. For the girls, Fleur Hollyer maintained her unbeaten run in the speed bounce although pushed closer by her nearest rival on the occasion winning 85-84 in the 30-second time. She also finished third in a hard-fought two-lap sprint. For the under-13 girls, both Amelie McGurk and Lucy Hollyer had a busy afternoon scoring in the four-lap, speed bounce, long jump and shot putt before combining well in the eight-lap paarlauf. With less than a month to go until the first of the 2019 Corporate Challenge road races around Chichester city centre, entries are coming in from businesses, sports clubs and individual runners for the senior 4.5k contest. And primary and senior schools are busy getting their best squads together before the half-term break for their races. The first race will be on Wednesday, February 27, with primary-school runners kicking off the programme at 6.30pm and the senior A and B races due to start an hour later. As usual the race nights will be two weeks apart with the second and third races in the series on March 13 and March 27.